The Hon Joe Hockey MP handed down his first Federal Budget on the 13th May 2014. There are few winners but plenty of losers. Fortunately the superannuation system has not been overly tinkered with. And, with the exception of a temporary 2% budget deficit levy on high income earners, tax has also largely been left alone as well. Social security has been hit. Public servants face mass job cuts; the government is getting smaller. This is definitely a contractionary budget and may have negative implications for the economy. It may also delay RBA rate increases. Please note, all the announcements still need to pass through Parliament; until then they can be viewed as merely a statement of intent. The new Senate will be formed in July 2014 and if Labor and the Greens oppose any government legislation, the government will require six of the eight non-major party aligned Senators to vote with them. In addition, the devil is always in the detail, and the details aren’t yet fully known. 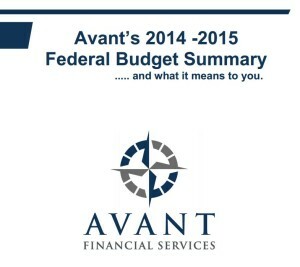 The Avant Budget Summary can be found here.